Long train rides require protein...like the leg of what was hopefully once some kind of fowl. 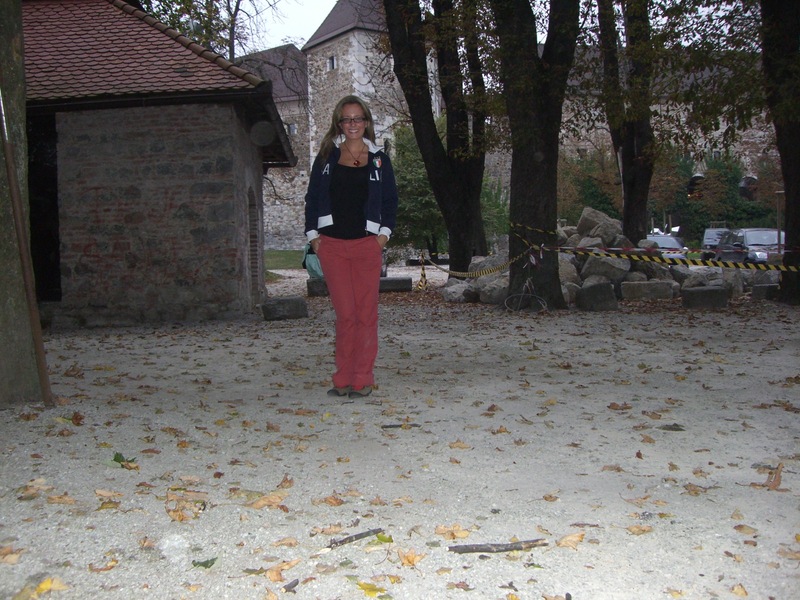 My Slovenian isn´t great, so I´m not all that sure. Although she doesn’t have to wait too long, as I’ll be there in time for dinner. Meanwhile, I can’t remember if I told you this already, but my iPod wigged out somewhere around Ireland. Since then, I have been reduced to a crazy and highly selective mishmash of music. Of 725 songs in its memory, it chooses to play only around two dozen of them. Truthfully, I find the particular lineup mysterious. Is my iPod trying to TELL me something??? Anyway, I used to have playlists to avoid such juxtaposition as Patty Griffin’s heart-breaking “Top of the World” fading into the rocking guitar intro of AC/DC’s “Shook Me All Night Long”. Now such moments are common place. There are artists I miss that my iPod has decided I didn’t need to be listening to anymore – Ani DiFranco, Tom Petty, Damien Rice, Kathleen Edwards, Bob Marley. Of those it will play, I am allowed only one little taste. However, it has magically preserved some of my favorite songs like Goodnight Elisabeth by the Counting Crows, Ootischenia by The Be Good Tanyas, and Pale Moon by Shannon McNally. For those small wonders, I am grateful. At the same time, as this short list is in regular rotation, I get plenty of chances to really hear each and every word. Again and again and again. Maybe this is just the madness talking, but it’s funny to me how some of the lyrics seem really apropos to me and my life right now. “I was wasted in the afternoon, waiting on a train.” Granted, I’m almost never wasted in the afternoon and certainly haven’t been on this solo journey, but I do wait on a lot of trains. On the other hand, maybe I’m getting all deep about these song lyrics because it’s all I have to drown out the sounds of all the loud talkers. Good lord, in what twisted laboratory are they breeding these people? I can tell you for sure that there’s one in Greece. On today’s train from Ljubljana to Maribor, near the Slovenia/Austria border, there were two Greek guys (according to them) who carried on so loudly that I thought maybe it was performance art. One of the guys was named “Alexandre”. I know this because the other would open every sentence by more or less screaming this and waggling a finger at him. He also gave him the ‘evil eye’ for like three hours. I don’t know what they were discussing (it was Greek to me! Ha ha), but they seemed so furious at one another, I couldn’t really fathom why they were traveling together. Thus I figured they had to be related. Meanwhile, despite the infernal ruckus (even with my 20 songs – detailed above – playing at levels certain to damage my eardrums and render me deaf long before my time), the other thing that made these two buffoons a particular spectacle was that the primary screamer was also a big eater. A big – no HUGE – eater endowed with what seemed an endless supply of pastries and Red Bull. It was like the Mary Poppins bag. He kept reaching in, and stuff kept coming out. Finally, a big thank you to all my friends who so kindly and generously offered to wire me money during my Bank of America ATM non-working debit card nervous breakdown. I am relieved to report that I actually spoke to a real, live human today and (theoretically – I didn’t do a trial withdrawal) the problem is solved!!! 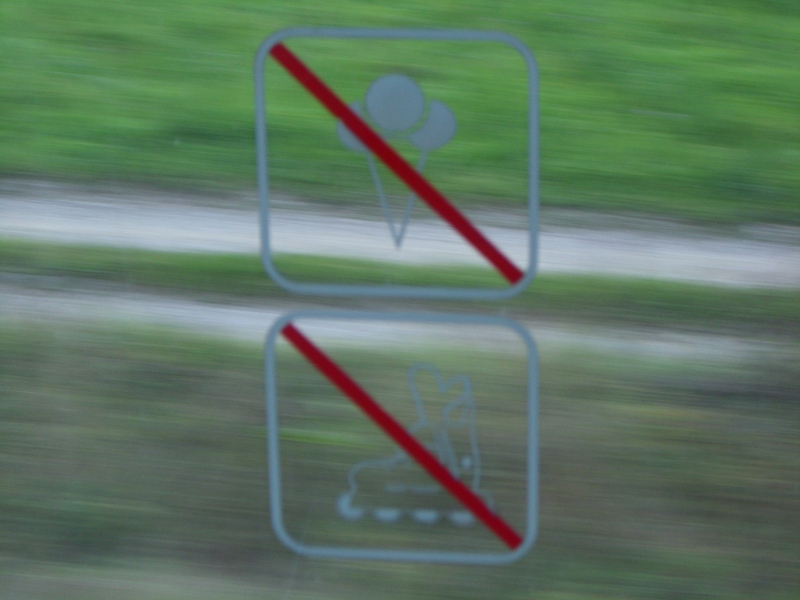 Unlike the Lithuanians, the Slovenians don´t want you bringing your gluttonous three-scoop ice cream cones onto their public transit.